The higher bandwidths and frequencies associated with many current designs, such as 5G and advanced wireless, require differential circuits and devices with improved sensitivity and low noise. Because of this, the margin for error associated with verifying differential components has narrowed considerably. Conventional methods of measuring noise figure are no longer adequate, as they do not provide the accuracy engineers need to efficiently characterize noise figure performance of 2-, 3-, and 4-port devices. Fortunately, there is a new process that utilizes dedicated software and leverages the advantages of the Anritsu Nonlinear Transmission Line (NLTL) sampling technology found in the VectorStar™ vector network analyzer (VNA) to achieve that goal. The option is available on VectorStar models (Figure 1) operating from 70 kHz up to 20 GHz, 40 GHz, 70 GHz, and 110 GHz. Engineers have recognized the importance of noise figure measurements for years, however, accurate noise figure analysis has become even more critical in today’s market. At the design stage, better accuracy helps to establish improved component performance. With these component improvements, engineers can optimize system performance for greater product differentiation and more predictable developments for faster time-to-market. Improved noise figure performance is also vital during production. Better noise figure accuracy can reduce measurement guard bands for tighter specifications, thereby creating a competitive advantage for companies. It can also lead to higher yields, greater throughput, and lower overall test costs. In the past, engineers have typically estimated differential noise figure using one of two methods. One approach is to perform single-ended noise figure measurements and expect minimal cross-correlated noise behavior within the differential amplifier. Another technique is to use a balun to combine the differential output into a single-ended measurement. A simple de-embedding of the path losses using an sNp file is included to account for the combiner imbalance. The balun method can miss imperfections on noise correlation and does not provide an understanding of the multi-mode behavior of the DUT. What is needed is a new technique that analyzes the correlation behavior of differential amplifiers and provides a clearer picture of DUT behavior. 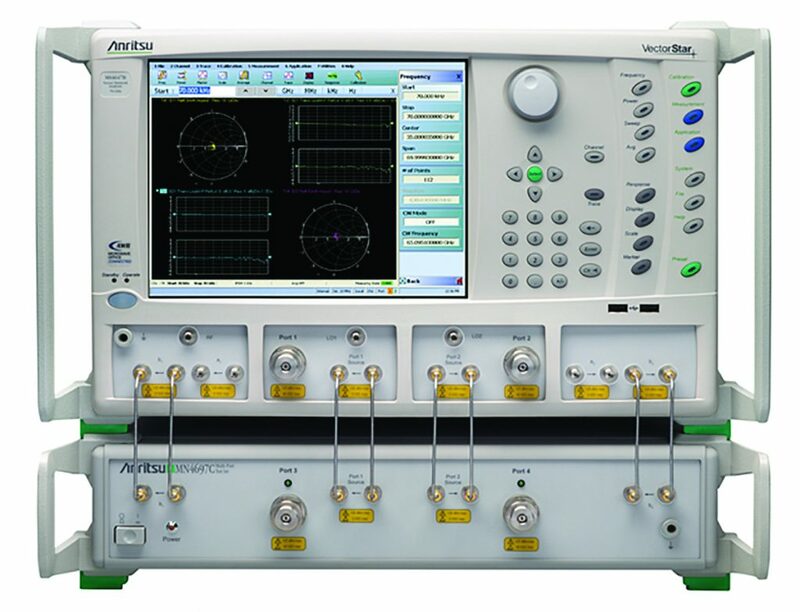 A VNA, such as the VectorStar, is typically used by engineers when they conduct noise figure measurements. The inherent advantages of the VectorStar platform provide benefits when conducting differential noise figure measurements. Its NLTL technology results in greater stability, an extremely wide RF sampler bandwidth to conduct measurements over a broad frequency range, and dynamic range of >100 dB across all frequency ranges. The VectorStar VNA also incorporates the cold-source noise figure measurement method. Cold-source was developed to eliminate the need for a multi-state noise source, which results in a simpler, better controlled noise source (nominally a termination at room temperature). The cold-source method minimizes the mismatch errors commonly found in the Y-factor noise source method. The new differential noise figure option enhances the 2-port, single-ended noise figure measurement capability of the VectorStar solution, and allows the VNAs to measure 3- and 4-port devices in single-ended, differential, and common-mode operation with a variety of processing options. Because the VectorStar VNA includes coherent receivers as a critical element of its architecture, the new enhanced noise figure option adds the ability to perform levels of correlated noise analysis with correction in 2- and multi-port devices with greater accuracy and without additional hardware options. The VectorStar VNA offers three approaches when conducting differential noise figure measurements. Each has its own set of considerations. Uncorrelated (Figure 2) – With this approach, the differential device is treated as two single-ended noise generators and measurements are made on both channels. The average of the two measurements serves as the final result. This approach can deliver an acceptable result to characterize the device, provided there are little or no isolation issues for the dual measurements. If there are any cross-correlation and isolation issues, however, some uncertainties will be introduced into the measurement that will affect accuracy. Combiner (Figure 3) – The second approach uses a balun. As previously performed by engineers, the balun is de-embedded using the sNp file to quantify and remove the balun imbalance. However, in addition to simply correcting for the path losses, the new VectorStar technique analyzes and takes into account the common-mode crossover and correlated aspects of the balun for improved differential noise figure analysis.This technique offers engineers the opportunity to include the same baluns used previously for validation of the technique. Since the next method does not require the use of a balun, it is anticipated that the combiner method will not be the preferred choice for accurately analyzing noise figure of differential devices. Correlated (Figure 4) – During this process the VectorStar VNA identifies and characterizes the correlated noise powers that are in the measurement system and removes them using the correlated method without the need for a balun. The unique VectorStar correlated technique is available through the differential noise figure software to identify and extract the correlated noise present at the differential outputs to avoid the sources of error. Measurement analysis of both correlated and uncorrelated noise can be conducted with the new differential noise figure technique. It is a superior method than conventional approaches that offer only a single-ended description that neglects correlation between DUT output ports, which lead to improper characterization of differential devices. The result is more comprehensive characterization of actual device performance that can lead to optimum product performance, faster time-to-market, and lower cost-of-test. previous A Non-Linear Analysis of the Saturated MOSFET by Dr. Alfred Grayzel, Consultant, Planar Monolithic Industries Inc.